Last night Nicole Richie attended What Goes around comes around fall '09 collection preview at Space 15 Twenty in Hollywood. 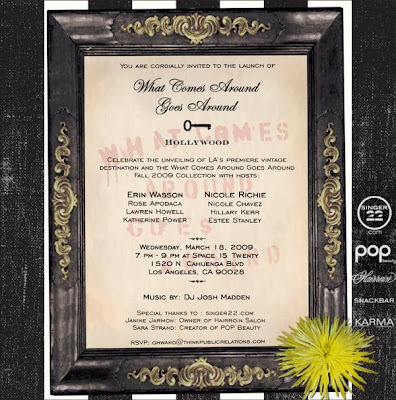 Here is the flyer which was used to promote the event ..
Nicole Richie was looking FABULOUS!! Nicole Richie's baby bump #2 was so prominent!! I think it may have grown overnight ..
Nicole Richie wore a yellow silk cardigan over a basic cream vest and matched the top with a pair of classic blue denim skinny jeans. Nicole Richie completed the look with a pair of Christian Louboutin's and carried a clutch which matched the yellow and cream tones of her top and cardigan! I loveee Nicole Richie's wavy hair look with the fringe! 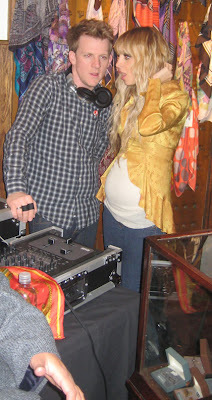 Nicole Richie chatting to her Brother in Law Josh Madden whilst he DJ's .. It is good to see Nicole Richie showing off her baby bump! I hope i look as good as Nicole whenever i am pregnant. People.com have a great little video about the boutique "What Goes Around Comes Around" which you can see here! !